We’ve all been there: a bad boss, dodgy landlord or love affair gone wrong and suddenly, you need to get out fast. But that’s not always an easy thing to do, especially if you don’t have the cash to cover the rent and keep the lights on without that job or live-in partner. That’s where a F*** Off Fund comes in. First coined by Paulette Perhach, the term F*** Off Fund might be new to you - but it’s something every financially savvy person should understand. So just what is a F*** Off Fund, why do you need it and how do you get it? We’ve broken all this down below to help get you started. What is a F*** Off Fund? A F*** Off Fund is really just a clever name for an emergency savings stash. It’s those extra funds you’ve squirrelled away over the years, so that if you’re ever need to move away from situations that are unpleasant - or in some cases even dangerous - you can do it without wondering how you’re going to make ends meet. Having a F*** Off Fund saved up means having the ability to leave an unfulfilling relationship, a bad job or a terrible rental property and never look back. For example, it could cover the bond on a new rental property, or the rent and grocery bills while you look for a new job. What if you’re not planning to quit your job, or leave your partner? What if you love your rental? That’s great, but remember that if you were expecting it, it probably wouldn’t be an emergency. Anyone can get hit by bad luck and not see it coming, but if you’ve got a F*** Off Fund tucked away, then at least you know you won’t have to worry about bills piling up while you get back on your feet. Because the uncomfortable truth is, one in three Australians admit they’re spending above their means and couldn’t come up with $500 in an emergency. Having that savings stash to fall back on is vital, because the alternative is often turning to credit sources, like a credit card or personal loan, and this can mean trouble. Say you have an argument with your landlord. You can’t stand to live in the flat anymore, so you immediately give notice and move out. It takes you a couple of weeks to find a new place, some of which you spend on friend’s couches, but for a few nights you’re stuck paying for a hotel. Meanwhile, most of your stuff is in storage and when you finally find a new place, you have to pay a month of rent upfront as bond - that alone is $1,638 on average. It’s easy to see how a situation like this could end in a bill of thousands of dollars - let’s say $2,000 for this example. If you don’t have savings, chances are you might wind up charging most or all of that to a credit card. If you're only making the minimum repayments with an average interest rate of 17.05%, that $2,000 bill will hardly budge even months later. The bottom line is, everyone should have an emergency cash stash, whether you call it a F*** Off Fund or not, just in case. How much should I have saved for an emergency? Convinced? Good! The next step is working out just what your F*** Off Fund should look like. How much is enough? That will depend on a few things, like where you live, and what outgoing expenses you need to keep up with. Ideally, an emergency savings buffer should cover your expenses - including rent, power bills, groceries and transport - for 3 months. It’s also a good idea to consider costs like entertainment, clothing and the occasional meal out in your calculations just so you know you’re covered in all situations. Although everyone will need different emergency savings, the team at Mozo crunched the numbers for F*** Off Funds around Australia, to give you an idea of the amount you should be shooting for. How long will it take me to build up my savings? That depends on you! Everyone has different priorities and abilities when it comes to saving, so everyone’s savings strategy will be different. Factors that affect how long it will take you to save up your rainy day fund include your income, your outgoing costs, like rent, transport, credit card payments, groceries and internet bills, as well as the savings plan you’ve put in place. 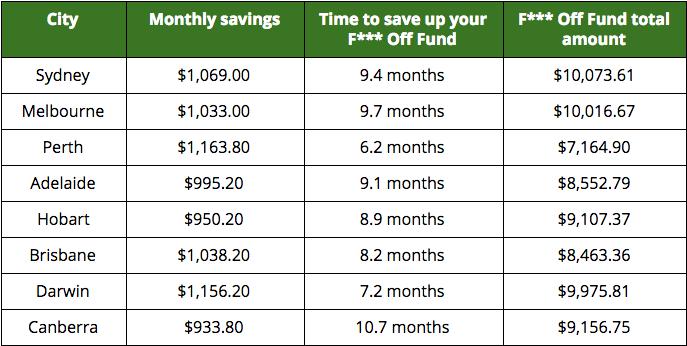 To help you start planning your savings strategy, we’ve worked out the average time it takes to build up a F*** Off Fund in each capital city, assuming you’re saving 20% of your monthly income. On average, you should plan for around 9 months to build up your savings buffer. If you’ve worked out your own F*** Off Fund savings goal, you can use our savings goal calculator to work out how long it will take you to reach it with your current savings plan. Set up a dedicated savings account. If your F*** Off Fund is mixed in with your regular savings - or worse, with the money you use day-to-day - it’s that much easier to justify dipping into it. So first things first, choose a high interest savings account and label it “F*** Off Fund.” That way, you can clearly see how much you’ve saved - and you won’t be able to ‘accidently’ dip into it. Set a savings goal. Saving is always easier when you’ve got something to work towards. Often, that’s some kind of reward like a holiday or a shopping spree. But with an emergency fund, the goal is an amount that ensures you financial freedom - so work out your dollar figure, or use the amounts we’ve listed above and start saving! Automate your savings. It can be easy to forget about adding to your savings balance, especially if you’re not used to doing it. So take the hassle out of the entire process by setting up direct debit transfers between the account your paycheck lands in and your F*** Off Fund savings account. Keep chipping away. If your savings balance isn’t growing quite as quick as you’d like it to, don’t get discouraged. An emergency savings plan is a long term strategy and the important thing is to keep working at it - even if you only put away $10 a week, that’s better than nothing. Track your spending. An effective budget means keeping track of the cash your splashing not only so that you aren’t overspending, but so you can identify trouble areas in your spending - like your takeout habit or that gym membership you never use. Look for ways you can cut back on unnecessary spending, even temporarily, while you build up your emergency savings buffer. Start right now! Today is the best time to start building up your rainy day fund, because you never know when you’ll need it. So instead of putting it off until later, or promising yourself you’ll start on Monday, get started today by choosing a savings account and making your first deposit.